Got aches and pains? Check out black cottonwood medicine. There are probably more black cottonwoods in our valley than there are people. Despite the fact that they provide welcome shade from our blistering summer sun and important wildlife habitat, some of us love to hate them because they have a nasty tendency to rot from the inside out and fall on sheltering livestock. They are also Messy Marvins, tossing trash everywhere – leaves, branches, seed fluff. Many of us avoid parking our cars under cottonwoods in the spring when the leaves are emerging from the buds and the trees are carelessly discarding the sticky husks that protected the leaf buds all winter. It turns out that sticky resin is a fabulous remedy for the pain of muscle and joint inflammation. In the late winter before the chemistry of the leaf buds changes from ‘antifreeze’ to ‘growth stimulant’, you can harvest them to make an infused oil for massaging into stiff, sore joints and aching muscles. Using a ratio of one part buds to 3 parts vegetable oil (I use olive oil), soak the buds for at least three weeks, stirring gently once a day to expose all bud surface areas to the solvent. I use 500 ml canning jars and cover the tops with paper towel secured with canning rings. This prevents stuff from falling into your oil but also allows the moisture from the buds to escape. Keep the oil in a warm place (in the oven with the oven light on) to help gently dissolve the resins into the oil. 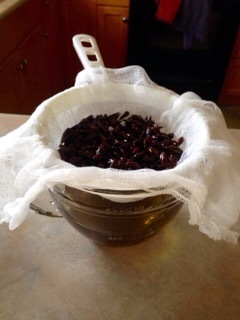 When your soaking is complete, allow the jars to sit at room temperature overnight then strain out the buds. Let the oil sit covered with a clean tea towel for another 24 hours at room temperature and then decant it into jars, cover tightly, label and store in a dark place. You can apply it to sore spots as is or mix it with other infused oils and essential oils, add some melted beeswax and presto: an absolutely fabulous homemade version of “Tiger Balm”. Happy Mental Health Week! Celebrate tonight at the Library. Stargaze. David Suzuki commands it.